Photos L to R (c) Linda Stewart 2007, Gay Glazbrook 2005, G. Diehl 1968. Above Left: Angie and Moxi daughter, "Epic." Above Middle: Moxi, Goodnight, Epic, Angie and Maya. Photo: Gay Glazbrook. Above Right, Angie at ten and her first horse. The word "nysa" means new beginning in Greek. Animals and people alike find Nysa Hill a beautiful and refreshing place to escape the grind of the city and reconnect with the land, the sky and one another. Angie Diehl, founder of Nysa Hill, has been a dog and horse person since her youth, teaching Western riding on quarter horses, and owning/raising Collies, Shelties, Irish Setters, Schnauzers and many lovable "All Americans" (code for mutts). 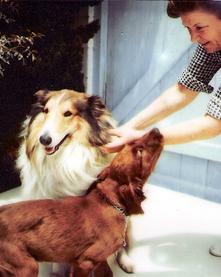 Mother Stephanie Diehl was most fond of her Shelties, especially "Lucas," sired by Ch Lobo Dell Carrousel of Stars, grandson of Ch Halstor's Peter Pumpkin ROM, who was tightly linebred on Kiltie-Golden Note. A blend of the best of the beautiful Sea Isle family, Peter remains the breed and Herding Group's all-time top sire with 160 champions. Father George Diehl, who grew up on a family ranch in Europe, instilled love of horses, hounds and good breeding in his kids. In addition to the purebreds at home, Angie was notorious for bringing home every lost or wounded dog she found "just for a few days." Once nursed back to health, they didn't leave. 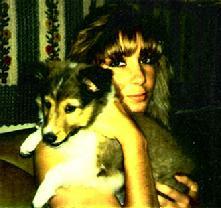 Angie's "heart-dog" was her beloved sable collie (rough) "Linus." College, then career required Angie to travel North America non-stop for some time. She was a Senior VP and top marketing executive at several of North America's top entertainment companies (see NysaHill.com). But the dream of getting back to pastoral life, nature and animals, never diminished. Nysa Hill is that dream realized. Her travel days easing, Diehl began to search for her newest dogs. She knew what she wanted this time - the Collie's sweet temperament, the Irish Setter's love of play, the Sheltie's size and smarts, but something with less of a coat for heavy warm-weather activities. She would get back to adding large dogs once a new home and separate ranch property were done, but in the meantime, several colleagues recommended whippets. That single tip led Angie to the next dog show nearby. She studied the sleek but sweet hounds congregating around the whippet ring. They had myriad colors and markings, but their eyes were all beautiful, filled with a beguiling look that emanated soul and spirit. 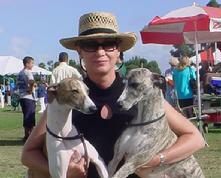 Diehl met many whippet breeders and owners. The first were Pamela and Lois Magette of Solaris. Then, Debbie Boyle of Illuminada, and owner of the renowned "Dash," who would play a pivotal role in her whippet life with Moxi to come. Debbie was the first to tell Angie that one should acquire "at least" two whippets, not one, because of their cuddling and affectionate nature. So the first two whippets for Nysa were a "Davis" daughter named "Goodnight," and a Swedish import named "Maya." They were unlike any breed she'd ever had. They not only became her beloved pets but show dogs, due to their excellent breeding and the conformation mentorship of many whippet friends. Renowned whippet handler Mary Dukes and her protege Mandy Clevenger showed the girls to their AKC Championships in short time, in addition to points by pro handlers Pam Lambie and Amber Lambie. Both Maya and Goodnight completed their championships with major wins at large specialties. In 2005, Nysa Hill expanded its conformation roster to include Vizsla (New) Ch. Koppertone Nysa Hill Shani. "Shani" is the daughter of "Teddy," the 2005 Best in Show at the National Specialty. Thanks to judges such as Mrs. Betty Stites, Mrs. Arlene Davis and Mr. Jon Cole, Shani finished her championship from the puppy classes while not yet a year old. Due to need, one of Diehl's dogs began a key therapy role in the hospital in 2003. Medical staff and patients alike responded so well to our "Maya," that a future was solidified. Nysa Hill was established not only to breed well, but to provide solutions to those in need, and to give back to the amazing animals whose unconditional love and spirit improved the lives of all they touched. Nysa Hill actively supports children's charities and the training of new dogs for future assistance and therapy work. We look toward future breedings emphasizing temperament, soundness and health, but most importantly, that special something that stirs souls.